George Pallete, a 15-year-old sophomore at Foothill High School, is currently a Life Scout (on his way to Eagle Scout) from Troop 36. He attended Tustin Memorial Academy for elementary school. George enjoyed his time at TMA, where he made lots of friends and had great teachers. He has many good memories from his time at TMA and wanted to give back to the school. When George was planning his Eagle Project, he contacted TMA first to check if there was something that would meet his Eagle Project requirements. He was told that the garden was in need of a bigger, more durable bench. 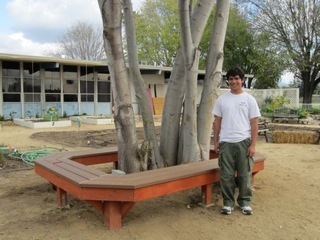 George decided to take on the project because he thought the bench would be a nice addition to the garden, especially because of the design and location. He completed the project in December 2011, thanks to the support of Troop 36 members, youth and adults. Without them it would have been really difficult.